Almonds are one of my favourite nuts to make milk from. They have a lovely soft sweetness and a very mild flavour so unlike sesame or sunflower seeds they won’t overpower the other flavours in your drink. Packages nutmilks are available to buy in the market these days and they are a great alternative to dairy milks or even soy milk which can often contain a lot of sugar. The problem with packaged nutmilks is they’ve been pasteurised, so they’ve lost a lot of valuable nutrients and life force. It’s so easy to make your own fresh nutmilk at home, it will save you money, you’ll use less packaging and ultimately, it just tastes better! This simple recipe is just a fancier version of your standard almond milk. I’ve used Lucuma for a mellow, low GI sweetness. Lucuma is a fruit grown in Peru. It’s dried and ground into a fine powder which has a lovely caramelly maple syrup shortbread kind of flavour. I usually buy the Loving Earth brand which is available in New Zealand and Australia. 1. Soak the almonds for around 6 hours or more in filtered water. 2. Drain and rinse the almonds then blend with 3 cups of filtered water until smooth. 4. Return the filtered almond milk to the blender, add the remaining ingredients and blend until smooth. Tip: If you choose to omit the banana for a thinner milk you might want to add an extra date for a sweeter drink. I like to drink this as is, but it would also be great milk to pour over some buckwheat cereal or you could add some chia seeds to make a chia pudding. Today is the Autumn equinox. Summer really feels like it’s gone now and the air is beginning to feel fresh and crisp. I just feel like donning a pair of unattractive slippers and sitting on the couch. So today we were thinking of Chai Tea and how delicious and warming the spices are, but we wanted to make a sesame milk version. This recipe has all the traditional Chai spices but not the caffeine, sugar and dairy that Chai usually has and you shouldn’t. This is a drink that will go down well with friends who are not raw because it’s just so tasty and if you don’t have figs on hand you could also substitute with dates. It’s perfectly autumnal. Blend the sesame seeds, water, ginger and cardamom pods together in a high speed blender for at least a minute. Strain and squeeze through a nut milk bag or piece of cheesecloth. Compost the sesame seed hulls and pour the milk back into the blender. Add the remaining ingredients and blend for another minute. Feel free to adjust the spices to your personal taste. 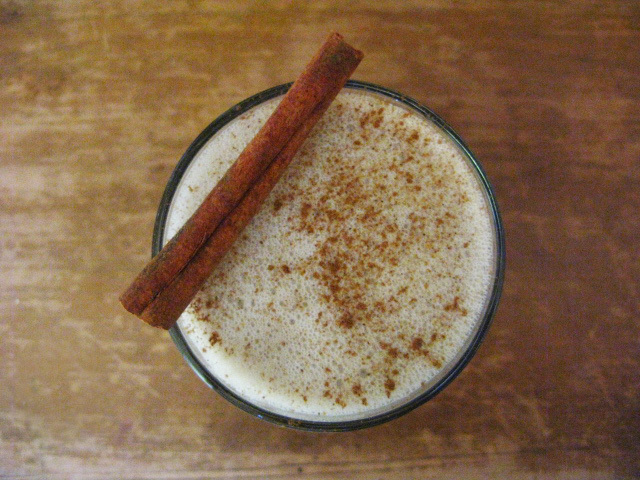 Pour into short tumbler glasses and sprinkle with cinnamon. Serve with a cinnamon quill to use as a straw. 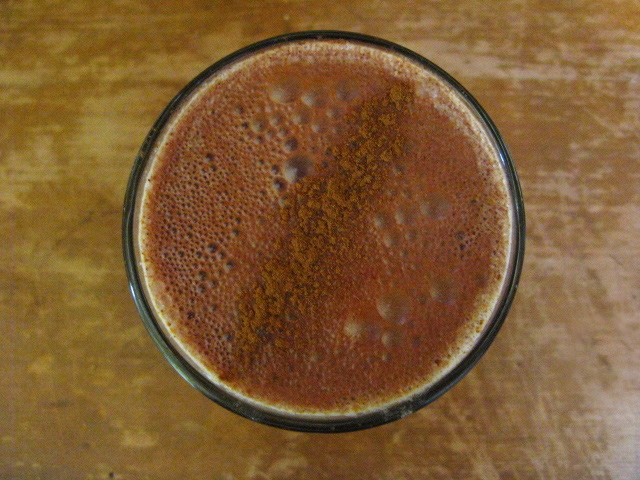 For a Chocolate Chai Milk simply add 1 -2 Tbsp of Raw Cacao Powder. Seed and Nut Milks are so easy to make. They are a great base for smoothies in place of dairy or soy. There are a number of videos on YouTube showing how to make the milk. This is a great demonstration by Karen Knowler. She uses almonds in this recipe which also make a delicious milk, I just use sesame seeds quite often as they are less expensive. There are just so many health problems associated with dairy products. If you think about it we are the only species to drink milk as adults and we are the only species to drink the milk of another animal. It’s infant formula for cows, do you really think it’s going to be good for a human to drink? Cow’s are usually pumped so full of hormones and antibiotics which end up in their milk and eventually into the person who drinks it. Check out this interview with Robert Cohen, author of ‘Milk, The Deadly Poison’ about the dangers of dairy.